The cause of the fire is from lightning. Many reported there was a huge lightning storm that passed over the fire on Friday evening, initially igniting the landscape near the Snake River. Photo Credit: Spokane County Fire District 8 Firefighters IAFF 3711. 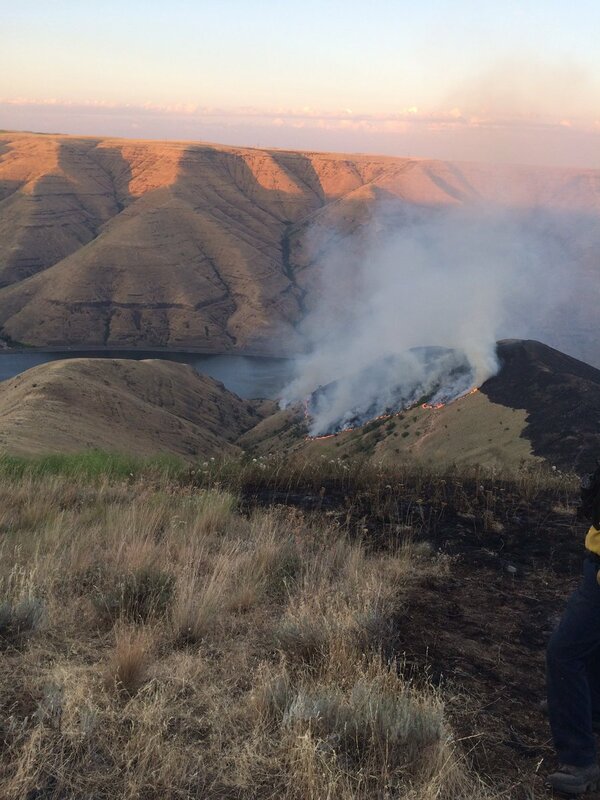 Size | The Snake River fire was reported earlier today as consuming up to 3,000 acres. No word on what the acreage is this evening. Resources | Around 2000 hours on Saturday evening (7/15/2017), State mobe was approved for this fire. The Public Information Officer (PIO) SE WA IMT Team 3 has arrived on the incident as of 2100 hours. 1 crew on order for the Baker River Hotshots along with the SE WA IMT Team 2. 3 additional strike teams ordered by the State Fire Marshal. 2 are already on-scene. Current Conditions | Terrain is very rugged and steep, which firefighters are working through as challenges. Fire crews have successfully lessened the fire. Threats | Homes, crops and cell phone towers. Pomeroy is the only City and County seat inside this least populated County inside the State of Washington. Pomeroy has the most amount of residents topping out at a whopping 1,389 (2015 estimation), while other communities such as Gould City, Pataha, Peola and Ping carry the remainder of residents. The County has a total of 2,247 inhabitants. Garfield County is known as an iconic town for being created in the 1800’s and has a minimum of 10 blocks that are on the State Historical maps. The County was created out of a large piece of Columbia County in 1881 then split off in half, creating Asotin County in 1883. The County is about 718 square miles with 711 as land and 7.5 as water. US Route 12 and State Route 127 run through the County while it also features the Snake River and the Umatilla National Forest. The County’s Northern border is with Whitman County; Eastern border is Asotin County; Southern border is Wallowa County (OR) and its Western border is Columbia County. ← #ToulouFire | Washington | New!